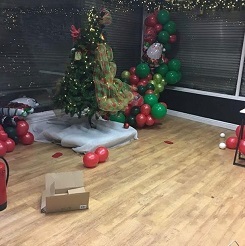 A Christmas pop-up shop in Liverpool was burgled just 48 hours after opening, rendering it unable to re-open over the Christmas period. Becka Corner had been planning the shop since February and had sourced decorations from all over the world that can’t be bought anywhere else in the UK. After opening on the Saturday, it was broken into sometime between closing on Sunday and opening again on the Monday morning, via a back door. Obviously, being a seasonal shop, this effectively wipes out the business for this Christmas as the entire stock was taken – even down to the decorations on the Christmas trees on display. The police seem reasonably confident that they will catch the perpetrators due to the unique nature of the products but that doesn’t help the business capitalise on the Christmas sales it was counting on. An intruder alarm with door contacts on the back door (the point of entry) would have sounded once the door was breached and if it was monitored this would have alerted an alarm receiving centre who could have notified the police. The sound of the alarm could have scared them off straight away but if not, the police may have potentially been able to get down there and disrupt them before they managed to clear the shop out. A CCTV system could have been a good deterrent, placed at the front and rear of the shop. Today’s IP cameras are able to capture really good quality footage now, even in the dark so thieves would definitely have thought twice about risking being caught on camera. Shutters on doors and windows would have made it much more difficult to get into the premises and when combined with the security measures above would have made it very secure. Not worth investing in security? If you have a retail shop and want to take measures to secure it, please call us on 0800 612 9799 for a no obligation survey and quote.